A 160-pound wonder from Japan set a new record by devouring a sickening 53 3/4 frankfurters in 12 minutes to win the annual Independence Day hot dog eating competition on Coney Island. The feat earned Takeru Kobayashi, 27, his sixth straight title in the event, held at the original Nathan's Famous hot dog stand on Brooklyn's seashore. He broke his own record of 53 1/2 hot dogs, set at the same competition two years ago. Thousands of raucous spectators jammed the streets in front of the hot dog stand, a block from the famed Coney Island boardwalk, to watch the competition and Kobayashi _ a top-ranked eater who once ate 17.7 pounds of pan-seared cow brains to win $25,000. 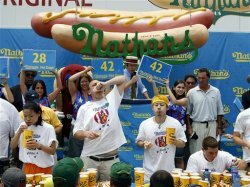 His strongest competition was Joey Chestnut, a 220-pound civil engineering student from San Jose, Calif., who set an American record by eating 50 hot dogs during a qualifying tournament in Las Vegas. Chestnut jumped out to an early lead in the competition, sometimes jamming franks into his mouth with two hands as the crowd roared. But Chestnut struggled, red-faced, with veins bulging in his forehead, the Japanese star methodically chomped dog after dog, often dipping them in a soft drink before cramming them into his mouth. Kobayashi passed Chestnut with about three minutes left in the contest. When the clock expired, Chestnut had swallowed 52 Nathan's franks _ not quite enough. Among the other competitors were another favorite, 100-pound Sonya "The Black Widow" Thomas, of Alexandria, Va., who once ate 65 hard boiled eggs in a little more than 6 1/2 minutes, and a local favorite, Eric "Badlands" Booker, a 425-pound subway conductor from Long Island who holds speed-eating records for pies and matzo balls.